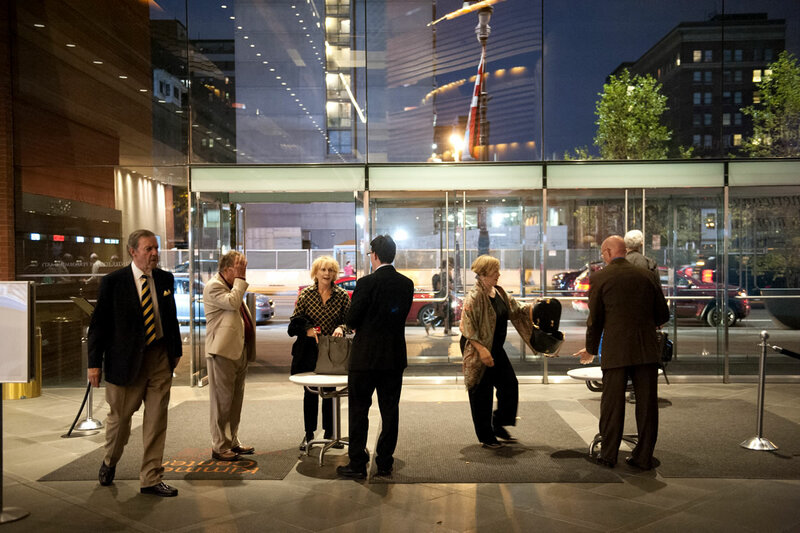 On Thursday, October 20, 2016, more than 200 members of the Fox Chase Cancer Center Laurel Society came together at The Kimmel Center for Performing Arts for an evening celebrating philanthropy and the advancement of cancer research and treatment at Fox Chase. The Laurel Society is Fox Chase’s signature donor society, comprised of our most generous supporters, many of whom are also Fox Chase patients, faculty, staff, or volunteers. Richard I. Fisher, MD, president and CEO of Fox Chase started the evening by graciously acknowledging the immense impact the members of the Laurel Society make in advancing the mission of the Center. He highlighted one such contribution - the newly opened Marian and Emma Brungard Surgical Family Waiting Suite. Looking toward the future, Dr. Fisher shared exciting plans on the horizon, including an expansion of the busy infusion room and a new retail pharmacy slated to open at the start of 2017. Paul Engstrom, MD, (left) and his wife Janet were honored for their combined 80 years of service to the Center. Also pictured: Dr. Richard I. Fisher.The Laurel Society Award was presented as part of the evening’s program, and for the first time ever it was given to a couple rather than an individual. Paul Engstrom, MD, and his wife Janet were honored for their combined 80 years of service to the Center. Dr. Engstrom shared highlights of his 46 year career as a medical oncologist and explained why giving back to Fox Chase is so important to his family. Janet Engstrom has served on the Board of Associates for more than three decades. Dr. Engstrom ended his speech by blowing a kiss to Janet to recognize their 55th wedding anniversary which was the following day. Rounding out the evening, Beth Brunswick, a patient at Fox Chase, shared her experience and paid tribute to the roles that clinicians, researchers, and donors all play in the effort to prevail over cancer. Beth was diagnosed with ovarian cancer in 2014. Although she resides in New York City, she chose to be treated at Fox Chase, where she sees Stephen Rubin, MD. In fact, she was Dr. Rubin’s first patient at Fox Chase. Raised by a father who instilled the importance of philanthropy, Beth has supported Fox Chase research to help future patients. Although her treatment is ongoing, she is confident in her doctor's ability to treat her. She began a new course of chemotherapy the morning following the event. Beth Brunswick speaking at the 2016 Laurel Society celebration.